Home DOST PAGASA Weather PAGASA Daily Weather Forecast as of today, 31 January 2018. PAGASA Daily Weather Forecast as of today, 31 January 2018. 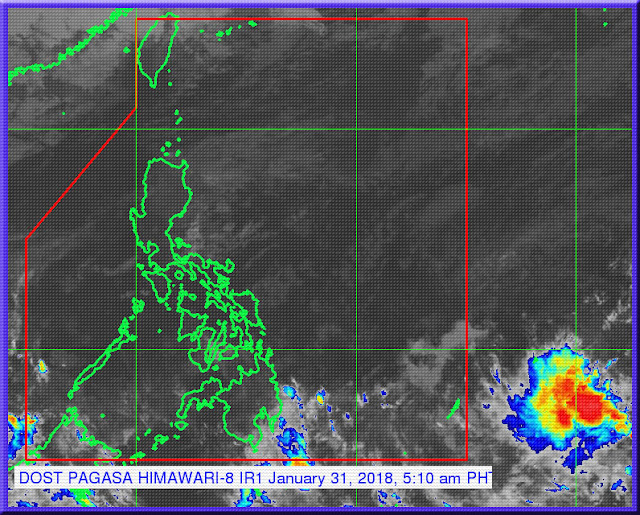 Northeast Monsoon affecting Northern and Central Luzon issued at:4:00 PM today, 31 January 2018. As of today, there is no Tropical Cyclone within Philippine Area of Responsibility but Trough of LPA will affect some part of Mindanao. Cordillera Administrative Region, Cagayan Valley and the provinces of Aurora and Quezon will experience Cloudy skies with scattered rains caused by Northeast Monsoon. Northeast Monsoon will bring Partly cloudy to cloudy skies with isolated rains in Ilocos Region and rest of Central Luzon. Partly cloudy to cloudy skies with isolated rainshowers will be experience in Metro Manila and rest of the country caused by Localized Thunderstorm.